We received this copy for review from the publisher in order to facilitate this review. No further compensation was received and, as always, all opinions stated around these parts are 100% our very own! 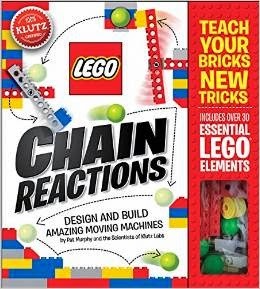 LEGO Chain Reactions from Klutz is designed to teach children how they can use LEGOs to build simple machines. You can build things that swing, roll, lift or drop. You are invited to build the machines individually but are also encouraged to try using the machines together to see what sort of chain reaction will be produced. We had a chance at reviewing LEGO Chain Reactions and, really now, how could that be passed up? LEGO anything and we're all in. The book arrived and was promptly handed over to my eldest (age 8) for him to enjoy. He was excited about it as he set out to put together the first machine. Q1: Were you able to create the first machine easily on your own? Yes. Q2: Did you have any problems following the instructions on your own and putting it together? Not really. Q3: Were you then able to proceed to the second machine? No, because it needed to have more pieces than the ones that came in the box. Q4: How many sets of instructions are included in this book/how many machines could you make with it? It includes 10 instructions and I could make all of the machines. Q5: With the LEGOs you have on hand? With the ones that I own and the ones in the book, yes. Q6: Did you like this book? Yes. Q7: What did you like about it? I liked the pieces the book came with and how the machines work. Q8: Can you see yourself spending more time with this book, or not very much? Not a whole lot. Q9: What about this book do you think would make other people like it? It depends on what they like and how they like to play LEGOs. It pretty much just shows you how to make the machines. Q10: Are you glad you had the chance to try it out? It was kind of fun to try it. Q11: What is your favorite way to play LEGOs? I like to try to make my own sets. Do note that LEGO Chain Reactions indicates that it comes with "30 essential pieces" to build the machine and it does indeed. However, it does not contain all of the bricks you will need. One helpful Amazon reviewer identified the bricks that you would need in addition to the ones which come with the book in order to complete the projects. I rather chuckled over the reviewer who pointed out that although the book tells you not to worry about your bricks matching in order to complete the machines, certain kids have a meltdown if their bricks do not match. (*Waves hand in the air*) If you have a good sized LEGO collection of your own, you probably have what you need to do the projects contained in this book. But do note the bricks are required above and beyond what the book itself offers. If this sounds like a fun title that you and yours would like to try, I am happy to say that Klutz has offered one giveaway to one of my readers here at Reading to Know. Care to win? Simply leave a comment below. This contest is open to U.S. Residents only and will be open through Tuesday, May 5th. Best to you! Many thanks to Klutz who sent a copy of the book my direction in order to facilitate the review and also for the giveaway copy! Oh my goodness! This is awesome! You know, my oldest graduates soon and STILL plays with his legos. I'd love to win this. Thanks for sharing the review. My son creates his own moving machines from LEGOS every week. He would love this...I hope. I wonder if it would be helpful for teaching science camp this summer (with LEGO activities daily). Thoughts on that one? That looks fun. My kids play with the Legos that my mom (bless her) saved from when Monica and I were kids! My daughter has decided she likes Legos; I'd love to win this book. My son is 3 and already loves LEGO. We would find hours of fun with this. With this book in hand and a handful of basic bricks from your LEGO® collection, the only other thing you'll need is a little imagination. My son would LOVE this! He's a Lego fanatic and he's always been into how things work and inventing his own contraptions since he was tiny. I love playing with legos with my kids! Oh wow! Easton would LOOOOOOOVE this! Thanks for the review and the giveaway. It looks like a great birthday present even if we don't win!